Siamese Cats - The Siamese is one of the first distinctly recognised breeds of Oriental cat. The exact origins of the breed are unknown, but it is believed to be from Southeast Asia, and is said to be descended from the sacred temple cats of Siam (now Thailand). In Thailand, where they are one of several native breeds, they are called Wichien-maat (a name meaning "Moon diamond"). In the twentieth century the cats became one of the most popular breeds in Europe and North America. All Siamese have a creamy base coat with coloured points on their snouts, ears, paws and lower legs, tails and (in males) scrota. Originally the vast majority of Siamese had seal (extremely dark brown, almost black) points, but occasionally Siamese were born with blue (a cool grey) points, genetically a dilution of seal point; chocolate (lighter brown) points, a genetic variation of seal point; or lilac (pale warm gray) points, genetically a diluted chocolate. 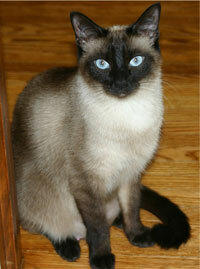 Siamese are affectionate and intelligent cats, renowned for their social nature. They enjoy being with people and are sometimes described as "extroverts". They are extremely vocal, with a loud, low-pitched voice â€“ known as "Meezer", from which they get one of their nicknames â€“ that has been compared to the cries of a human baby, and persistent in demanding attention. They also have a great need for human companionship. Often they bond strongly to a single person. These cats are typically active and playful, even as adults. The social orientation of Siamese cats may be related to their lessened ability to live independently of humans. Siamese coat colouration is appealing to humans, but is ineffective for camouflage purposes. They are less active at night than most cats, possibly because their blue eyes lack a tapetum lucidum, a structure which amplifies dim light in the eyes of other cats. Like blue-eyed white cats, they may also have reduced hearing ability. Therefore, being dependent on humans may have been a survival trait for ancestors of the Siamese. This information is licensed under the GNU Free Documentation License. It uses material from the Siamese Cat article on Wikipedia.org. 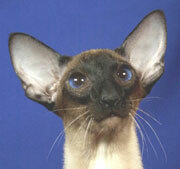 Siamese Cat Breeders - Advertise your cattery kittens and cats here. Breeder of ACA and TCA registered Siamese kittens - Oklahoma - We Are Siamese Cattery a breeder in Oklahoma specializing in ACA/TCA registered Old-Fashioned, Old-Style, Applehead, Traditional and Classic Siamese kittens exclusively - NO show extreme wedgeheads! Melkatz Kattery - Florida - We are a small kattery located in Miami, Florida area. I am a vet tech experienced in animals health care for over 17 years. We spoil our babies and they are our children!! Our show wedge style siamese are registered with CFA and come in a rainbow of colors including: Torti, Lynx and Red Points -^. .^- We also have Abyssinian kittens occasionally in all colors!! Our kittens get all three FVRCP/Luekemia and Giardia booster shots before leaving our home at 14 weeks of age. Contact us (toll free) (888) 998 - 7483 for prices and upcoming litters. 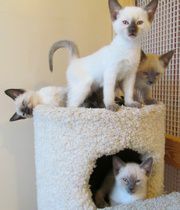 Su-Su Cattery - Florida - Fine Siamese since 1970. Breeding all four point colors. Katz Meow Cattery - Katz Meow Cattery is a Michigan breeder of purebred old-fashioned Siamese kittens, registered with ACA & TCA. We are motivated by the love of this breed and wish to help preserve them by raising healthy, loving, people-oriented cats. 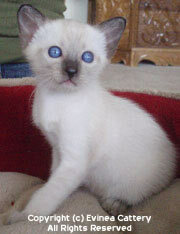 We breed the 4 standard colors for Siamese which are Seal Point, Blue Point, Chocolate Point and Lilac Point. Kittens leave at 9 weeks with 1st shot and are dewormed, plus a health guarantee and spay/neuter contract. More INFO on website and many photos of new kittens, Dams & Sires - also scrapbook & testimonials from owners of past litters.